Quartet Records and M.G.M. 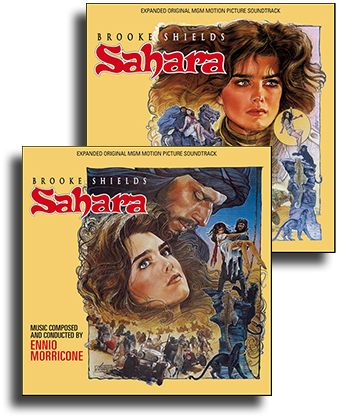 present the premiere complete edition of Ennio Morricone’s Sahara, composed for the Brook Shields adventure movie written and produced by Menahem Golan, directed by Andrew V. McLaglen. Sahara tells the tale of Dale Gordon (Shields), a young car racer who wants to save her late father’s business by winning a desert rally through the Sahara. Even though women are forbidden to race, Dale dons a disguise to enter the competition. Unfortunately, the desert is ravaged by warring tribes and one of them captures the girl. Seeking refuge with the noble Jaffar, Dale could easily relive a classic Oriental fantasy inspired by Rudolph Valentino’s The Sheikh – but she must also stop the German bad guys and win the race for her father’s honor. Ennio Morricone’s score for the expensive production provides a rich, versatile and powerful epic soundtrack – a real gem and a treat for all Morricone fans. It features a lush main theme for the sweeping romance in the desert, exciting action themes for the battles and three different themes for the race itself. This ultimate edition is presented as a 2-CD set (for the price of one). Disc one contains, for the first time, the complete score as written by Morricone for the film. Since there were many cuts and changes in the picture, a lot of music was left out of the final print; many cues were moved around or repurposed, so some of this music will be a new listening experience. Disc two contains the original LP program as it was assembled by Morricone. The LP was released with this program all around the world, except in the U.S. where Varèse Sarabande modified the program from Morricone’s original selection. This is the first time the composer’s presentation is being released on CD. It includes many tracks that do not appear on disc one: album versions, source cues, edits, slightly different mixes, and a song recorded specifically for the album. Mastered by Dániel Winkler from the three-track stereo mix tapes and the two-track stereo master album, all courtesy of M.G.M. Project supervised by Claudio Fuiano. The package comes with a lavishly illustrated 20-page booklet, featuring comments from Gergely Hubai, who shares anecdotes about the filming and discusses the many cuts and changes through a track-by-track breakdown of both discs’ programs. The CD is limited to 1000 copies.